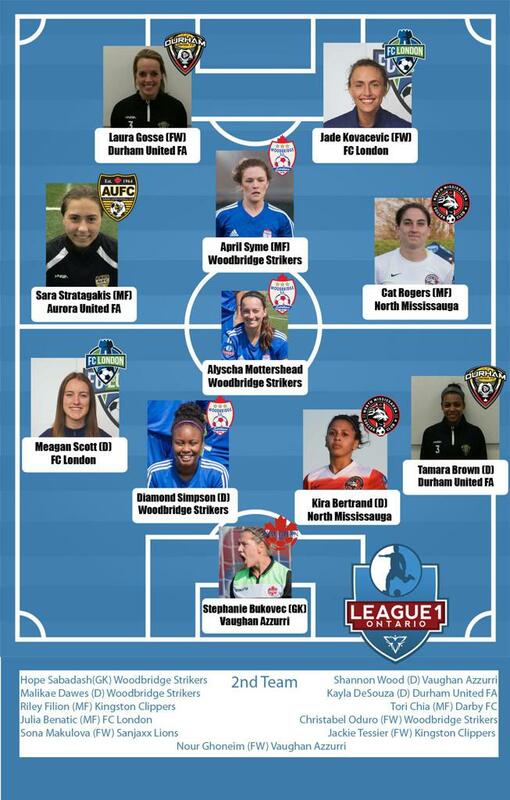 In the second of a set of daily League1 Ontario 2016 Awards announcements leading up to the L1O Awards banquet on Sunday November 27, the 2016 Women's First and Second Team All-Stars have been revealed, featuring outstanding performers from the 2016 season. The All-Stars are elected by each team, and then voted upon by a committee comprised of technical staff from each team in the league, as well as league officials. Each team has had a minimum of one player nominated as an All-Star. The first team, laid out in a 4-4-2 formation, features 2016 Golden Boot winner Jade Kovacevic (FC London) and Laura Gosse (Durham United FA) up top as an attacking duo with plenty of goals to their credit. The midfield four features League1 Ontario Mid-Season All-Star MVP April Syme (Woodbridge Strikers), former CWNT player Alyscha Mottershead (Woodbridge Strikers), current Canada U17/ U20 player Sarah Stratagakis (Aurora United FC) and League1 Ontario Mid-Season All-Star Cat Rogers (North Mississauga Panthers). The defensive line matches the speed of fullback Tamara Brown (Durham United FA) with the steadiness and leadership of Kira Bertrand (North Mississauga Panthers), Diamond Simpson (Woodbridge Strikers) and Meaghan Scott (FC London). League1 Ontario Women's 2016 L1 Cup MVP Stephanie Bukovec (Vaughan Azzurri) anchors the 2016 League1 Ontario All-Star Team.